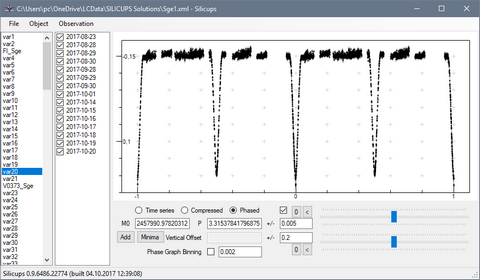 New version 2 of the post-processing software Silicups allowed to gather some statistics. Following table summarizes data acquired at BSO from the beginning of operation on September 2011. 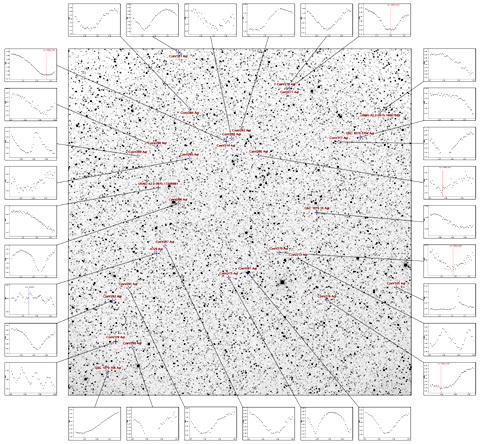 The CzeV catalog of variable stars is published. 472 out of 1228 stars contained in the catalog were discovered at BSO. 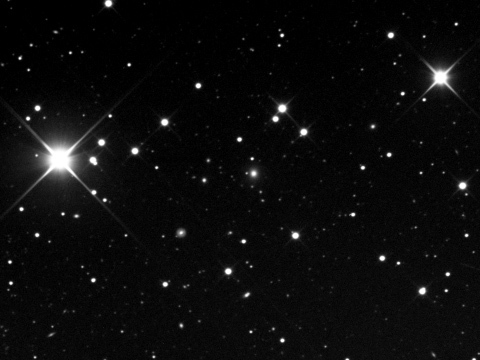 Result of pointing a telescope to the random coordinates in the constellation Sagitta. After 15 observing nights of this field, more than 140 variable stars were discovered, only 3 of them were already known. Click on the image below to show animated GIF with light curves of variables, for which the elements were determined. Every modern research project involves powerful computers and astronomy is no exception. 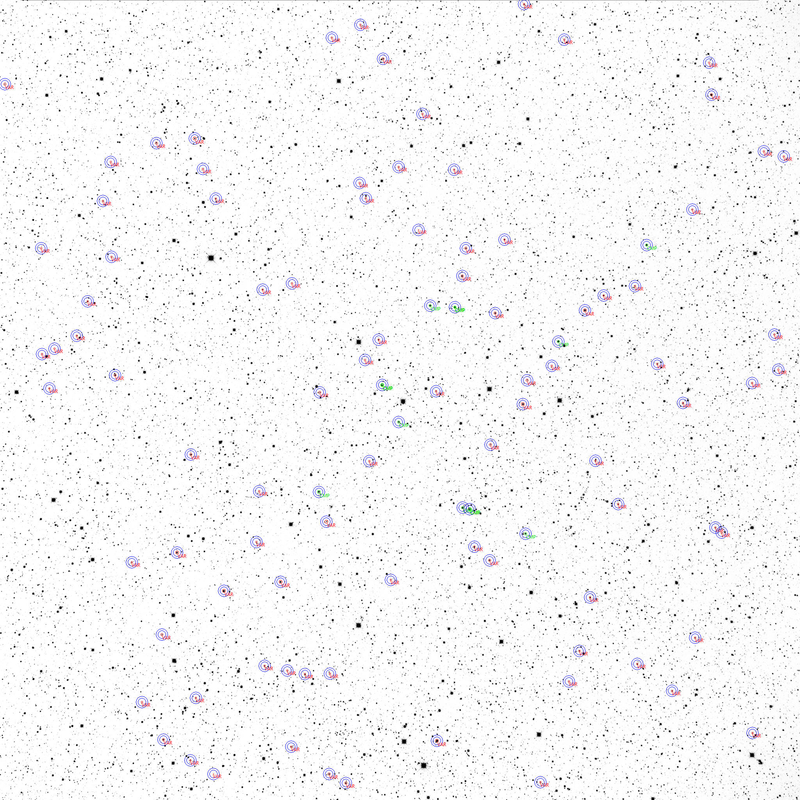 TCMT can produce close to 10 GB of data per night (hundreds of images, 32 MB each) and total number of stars, identified on all images, often exceeds 10 million. 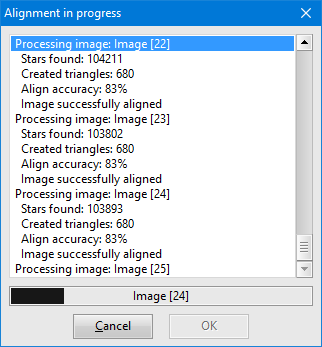 All images must be matched with reference catalog and photometry must be calculated for every star. Rather powerful Core i7 based computer with 4 computing cores and 16 GB of memory was replaced with Ryzen R7 based PC with 8 computing cores and 32 GB memory. 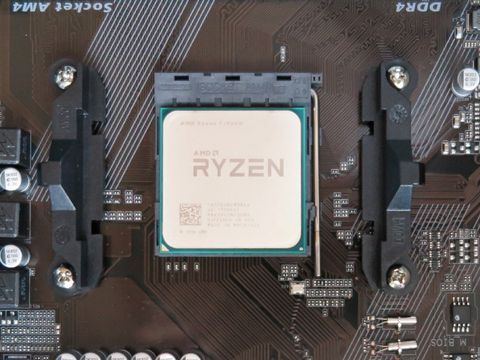 Achieving double computational power required some software hacks due to Ryzen architecture peculiarities, but the updated SIPS v3.4.1 can process the whole image set in less than half of time required by the original PC (the patch speeds up the SIPS execution also on Core processors, but the difference is not that high). The progress in data processing achieved over the years is significant. Observing series, which processing took many hours and sometimes it was necessary to let the computer work overnight, are now processed in a couple of minutes. While the modern computing hardware, cheap enough to be accessible to amateurs, plays very significant role in this speedup, clever software design is even more important. 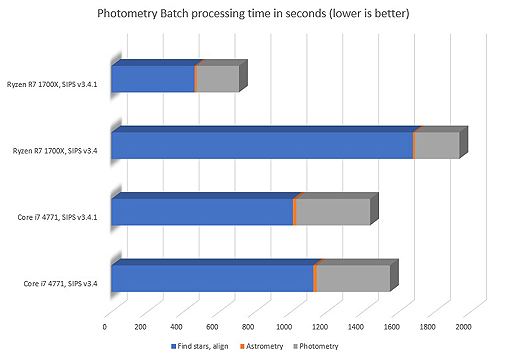 While achieving two times speedup requires completely new PC, the four times faster execution, achieved between SIPS v3.3 and v3.4, was purely software optimization. 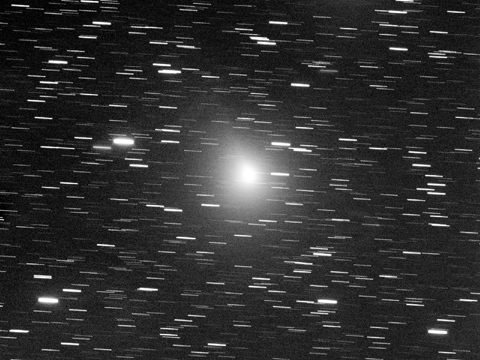 When the target variable star field sets, it is time to let the telescope goto comet 41P/Tuttle-Giacobini-Kresák and spend a couple of minutes on it just for fun. 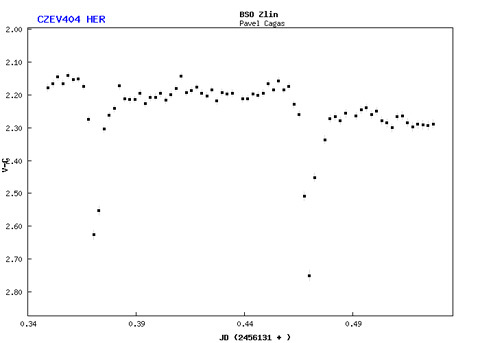 The 1000th star was added to the CzeV catalog and it was discovered using the TCMT. 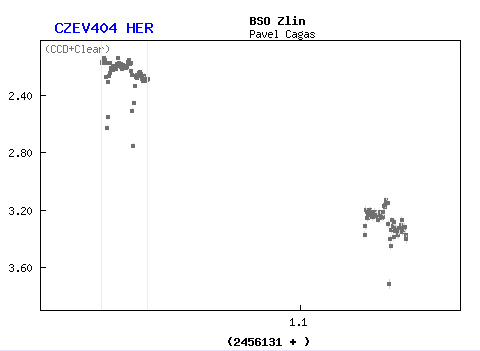 371 stars out of 1000 in the CzeV catalog were discovered at BSO. 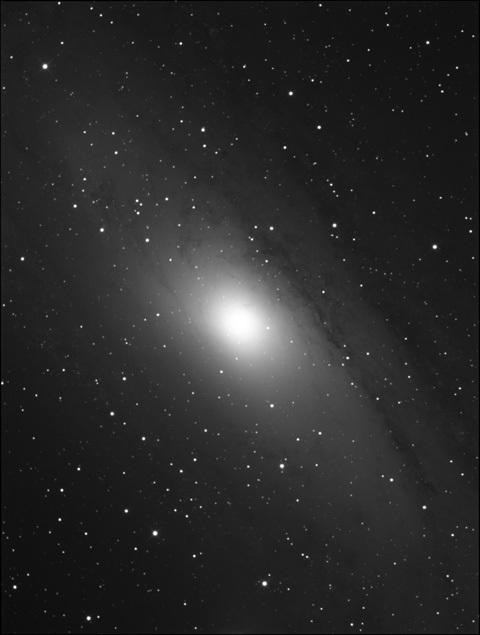 Single 120s exposure contains up to 100 000 stars 3 sigma above background in the 90'x90' field. 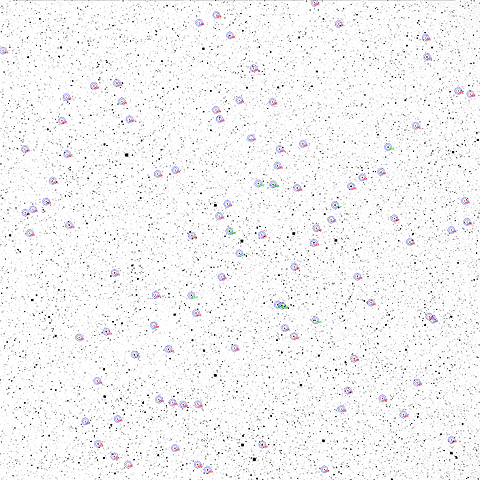 Number of detected stars can be around 150 000 after relaxing the threshold to 2 sigma only. The result is 167 variable stars in the single field. To date 336 variable stars were discovered at BSO. Original TCMT mirror, made of BK7 optical glass, was replaced with new Pyrex one. Combination of normal glass with carbon-fiber tube appeared to be unfortunate combination, because the thermal expansion of the glass was not compensated by expansion of the tube. The result was significant changes in focus caused by temperature changes during observing session. The new mirror is of excellent optical quality, the surface P-V difference from ideal paraboloid is only λ/19.2 and the difference RMS is λ/57.3 at λ=532 nm wavelength. Strehl ratio is 0.988. Awarded with Zdenek Kviz Prize for 2015/2016. 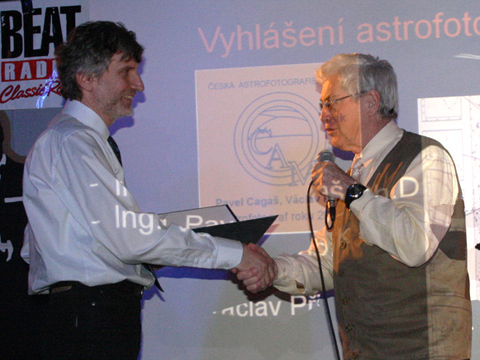 Jan Vondrak (left), head of the Czech Astronomical Society, just passed the award. 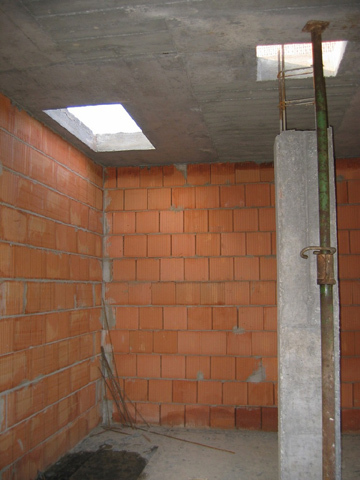 Image courtesy of Josef Chlachula. 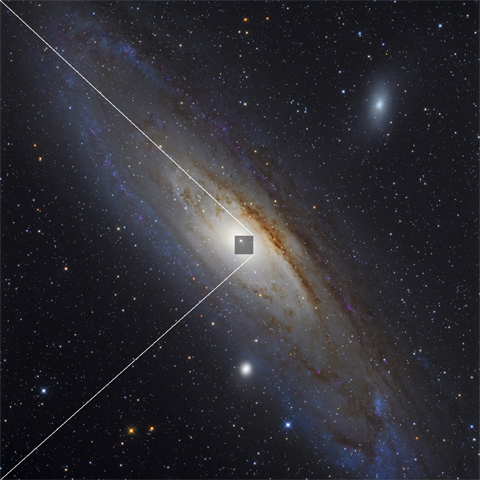 M31 Great Andromeda Galaxy is carefully watched for occurrence of novae by several groups of astronomers all around the world. 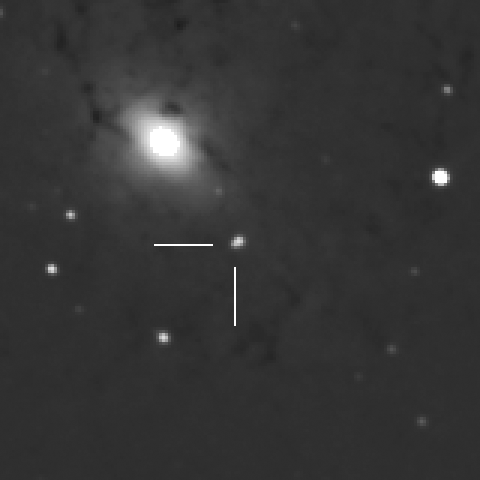 Still, apparently it is enough for a nova to hide very close to one of the M31 globular clusters to almost escape these watchful eyes. But even this attempt to hide was not successful due to TCMT high image quality and experience of long-time nova observer Kamil Hornoch from AsU CAS, Obdrejov. Crop of the Blue-filter image, processed with median filter, showing the nova (left) and the whole discovery image with the superimposed detail (right). 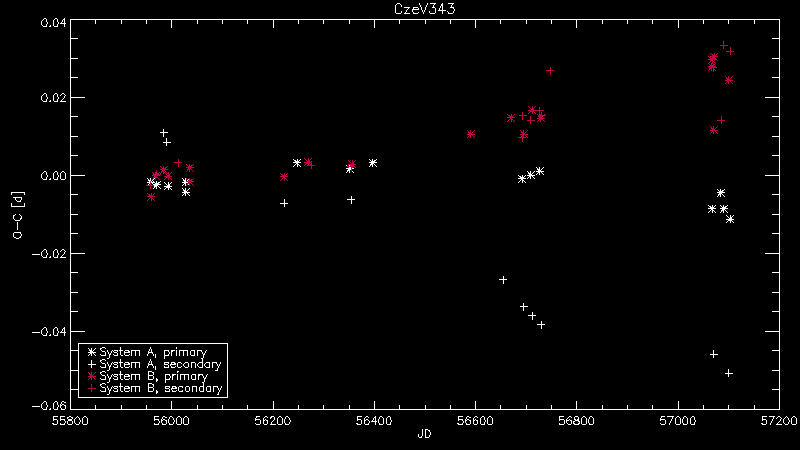 Another season of "double-double" star CzeV343 observing revealed even greater changes in O-C. Unfortunately the time span is still too short to deduce any details about mutual double-star orbit. 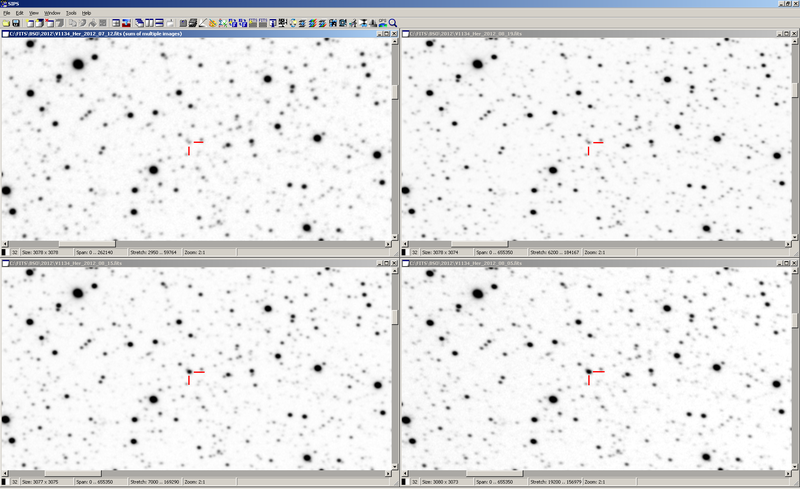 TCMT field of view around the V1134 Her variable star contains almost hundred variable stars. 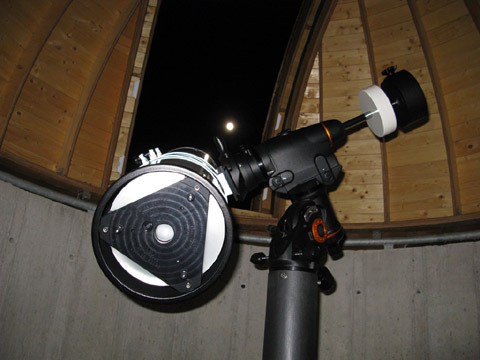 The first TCMT observing night proved its quality, providing round images of stars all over the very large field of view. 33 new variable stars were discovered mainly around the original field of V1134 Her, first observed in 2011. Total amount of variable stars in this particular field of view is 93. The faintest variable star varies from 17.6mag to 18.3mag. 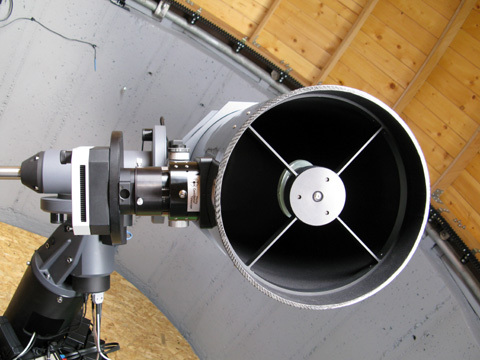 Upgrade of BSO instruments finished with installation of the new TCMT (Thirty CentiMeter Telescope). 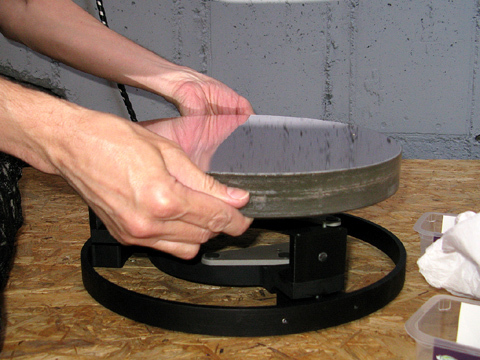 TCMT is custom designed and built to optimize every piece of optics and mechanics to cover full G4 detector without any significant vignetting and at the same time to provide seeing-limited sampling. 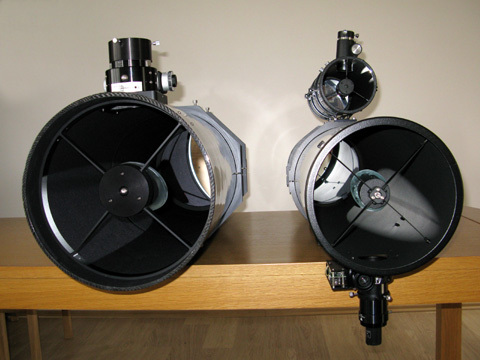 The new TCMT (left) compared to the original highly modified Orion SPX telescope (right). Field of view increased approx. 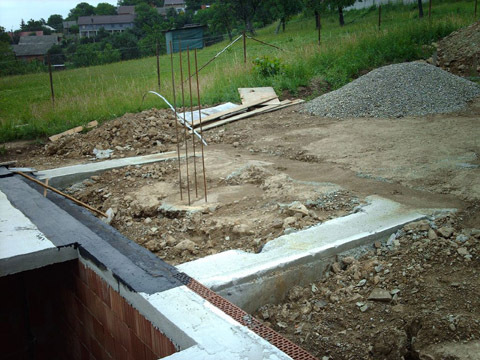 40% (from 70'x70' to 90'x90'). Vignetting in the field of the view crones is lower at the same time. Aperture area also increased by approx. 40%. No-compromise materials (carbon-fiber tube with carbon foam between inner and outer shells) and construction (secondary mirror holder made from single piece of aluminum, heavy duty 3" focuser, primary mirror cell made form 25mm thick aluminum, ...) keep the camera perfectly aligned and promise high-quality data all over the field of view. 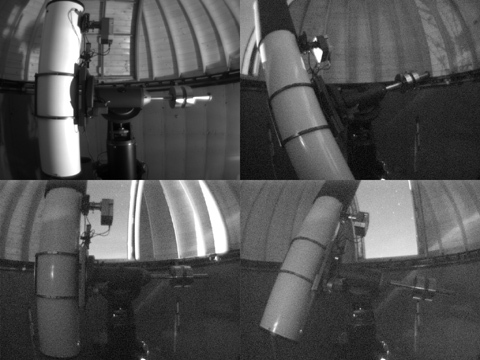 Dome context camera up and running. Dome interior remains perfectly visible at night without any additional illumination. 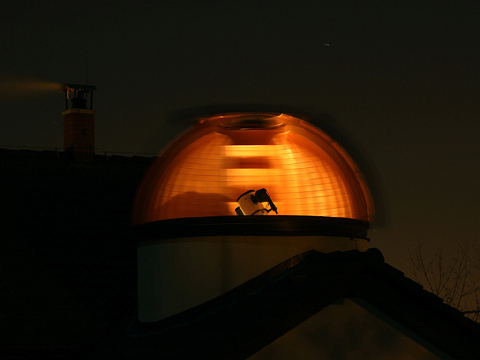 Even the Moon-less night sky appears bright compared to dome interior, illumination caused by nearby street light (lower left) looks like bright sunlight. 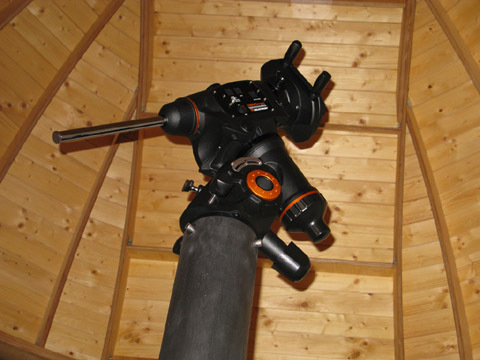 The new mount allows using of the best method of guiding – not to guide at all. The image below is a crop from a sum of several 180s long exposures. Each exposure without any trace of tracking irregularity, all stars remain perfectly round with seeing-limited FWHM. Wonderful performance made in the Czechia and very significant step forward compared to previously used CGEM. The most significant upgrade of BSO instruments in its history began. 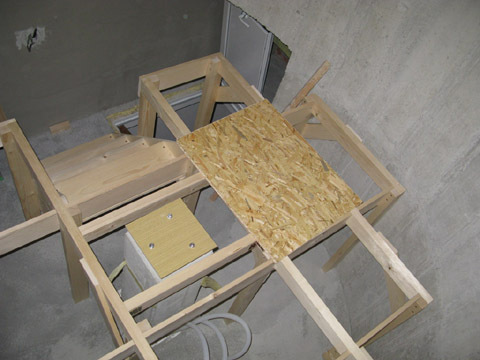 Three times heavier mount capable to carry three times heavier instruments was just installed. 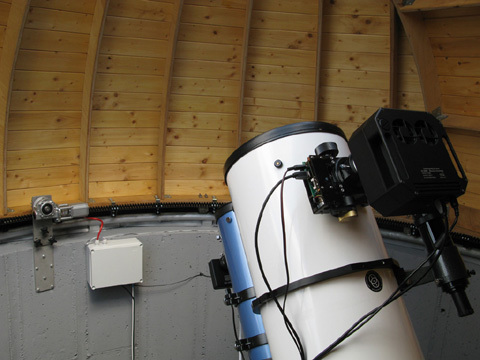 The new mount also promises significantly higher precision in both pointing and tracking and is way more suitable for unattended observing. And it is really a beautiful piece of engineering. 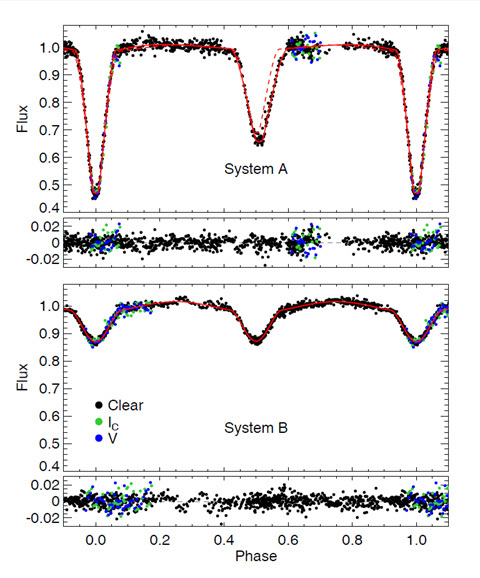 New article based on observations from BSO - frequency analysis of the newly discovered delta-Scuti pulsating components of the V729 Aql and of the two newly discovered Algol-type variable stars CzeV331 Aql and CzeV354 Aur. 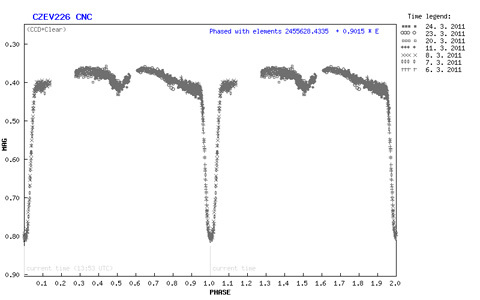 Unique "double-double" star CzeV343 starts to show significant changes in O-C after 3 years of observing. When this star was discovered in 2012, we had no proof both binaries are physically related, it was only very likely from various reasons. Now the gravitational bind between both eclipsing binaries looks even more probable. PDF version of the article is available here. One more previously unknown Algol-type variable found after more than 3 years of monitoring of single patch of the sky in Auriga. Even after more than 3 years of monitoring of single patch of the sky in Auriga, new Algol-type variable stars still happen. 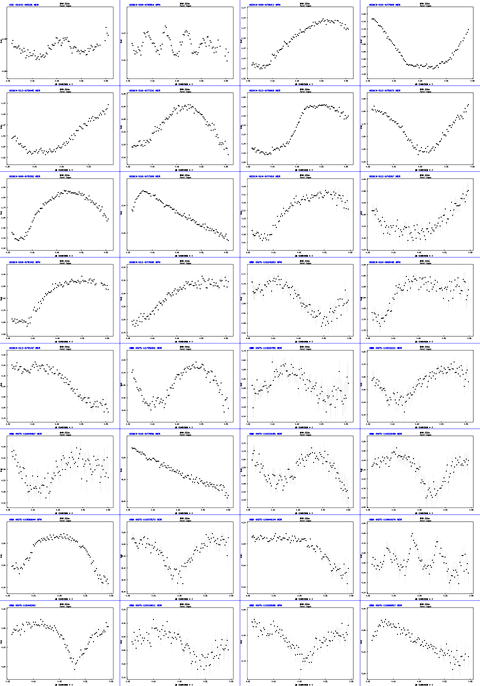 Asteroids sometimes passing through the photometric aperture cause peaks in star light curve. 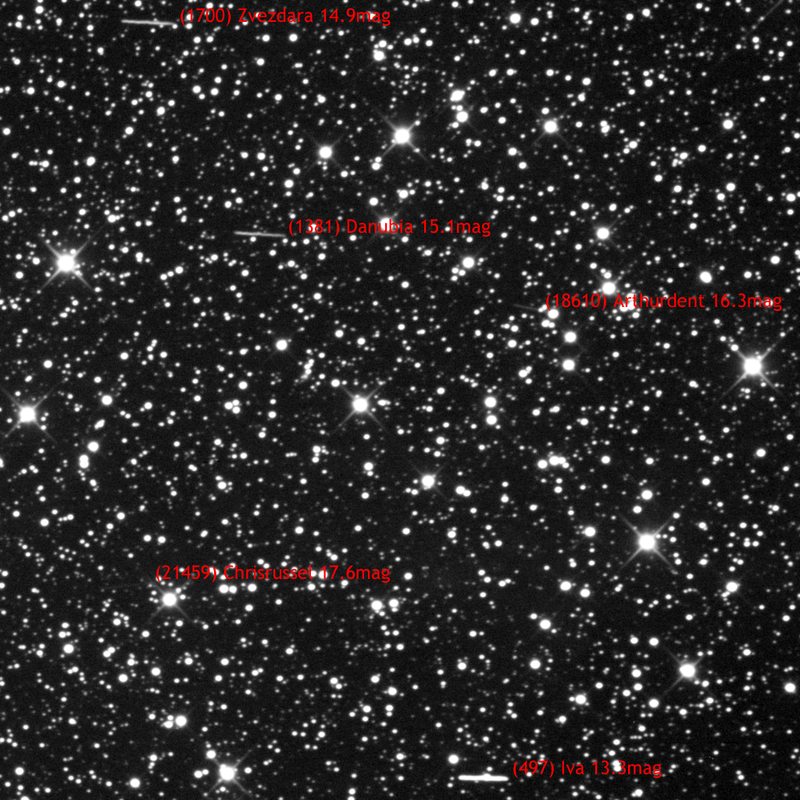 However, five asteroids in a 25' x 25' field of view are quite rare. 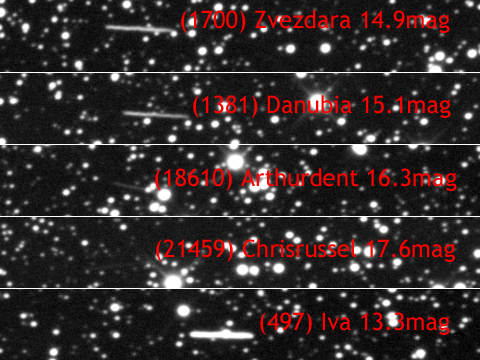 Click the image (or the link here) to see the 1k x 1k frame crop with asteroid traces on their respective positions. 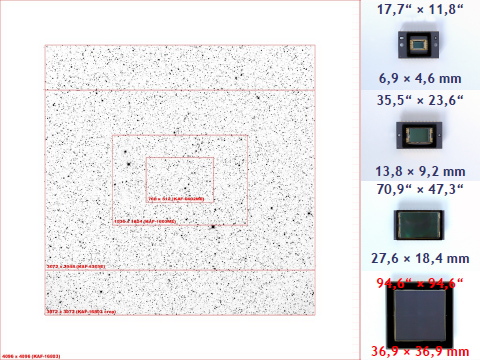 Original frame from BSO telescope is 9-times greater (3k x 3k pixels). Image is a sum of 42 frames, each with 180s exposure (total exposure time is ~2 hours). Frames were captured on Dec. 27, 2013 between 19:03 and 21:22 UT. Article about CzeV343 available on this web site. 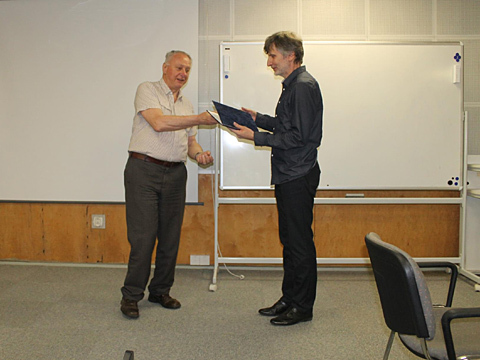 Awarded with Jindrich Silhan Prize: Variable Star Observer of the year 2012. 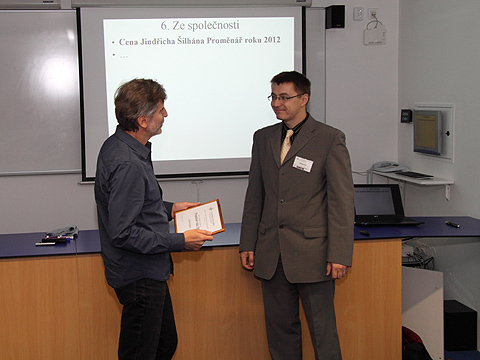 Lubos Brat (right), head of the Variable Star and Exoplanet Section of the Czech Astronomical Society, just passed the award. Image courtesy of Libor Sindelar. 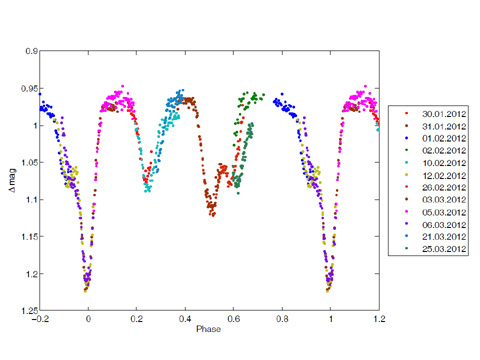 Light curves of eclipsing cataclysmic variables can be easily searched. But how such star actually looks during outburst? 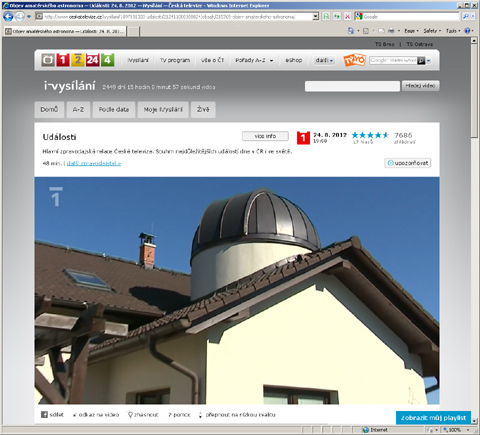 BSO mentioned in main evening news of the Czech Television public channel CT1. BSO featured on Prima TV evening news. 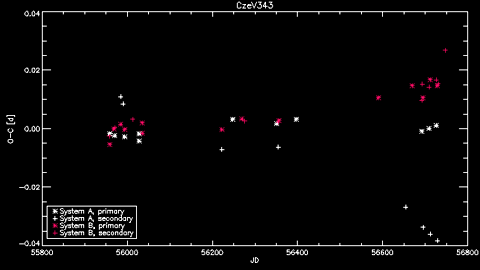 To date 111 of 416 variable stars in CzeV catalog were discovered at BSO. Popular article about CzeV343 published at www.gxccd.com. 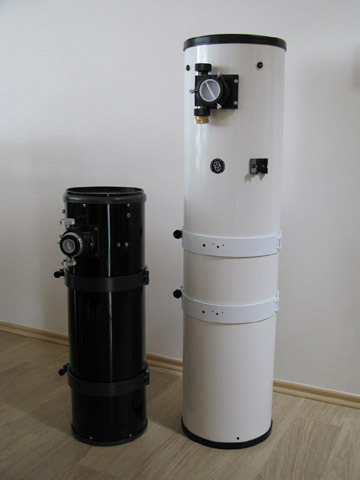 Article about CzeV343 published as Letter in Astronomy & Astrophysics, Vol.544 (August 2012). Separated light curves of CzeV343, as produced by Ondrej Pejcha's CzeV343 computer model. 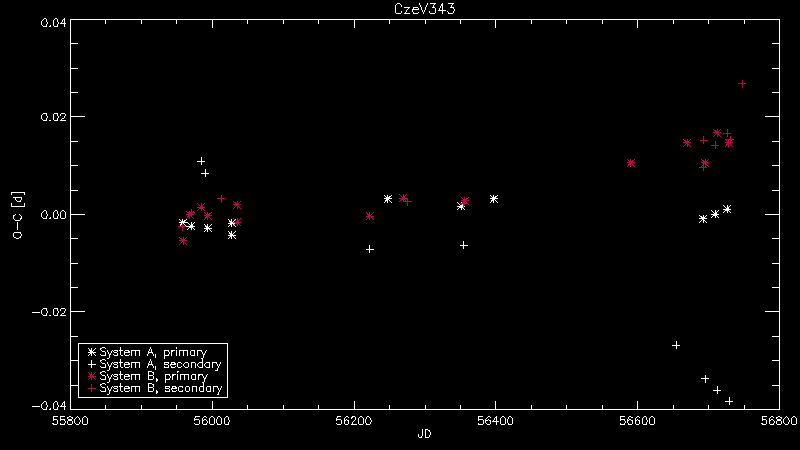 CzeV404 -- New eclipsing cataclysmic variable discovered during outburst. 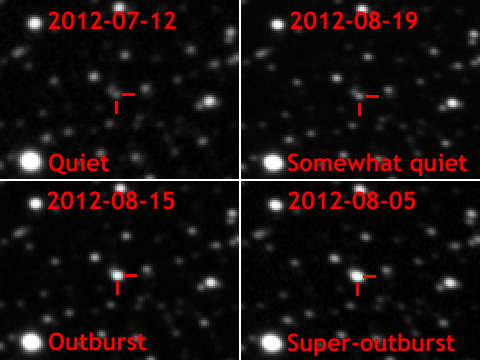 Series taken on July 22nd and July 23rd show decreasing brightness after outburst. Article about CzeV343 accepted to Astronomy & Astrophysics just two days after submission. 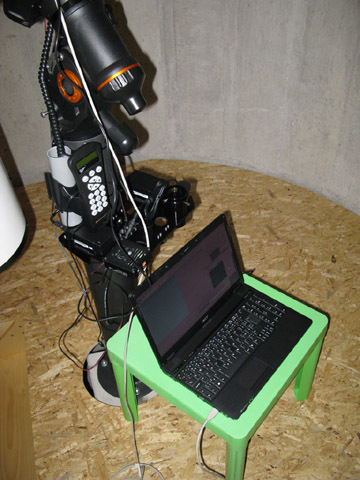 Computer-controlled dome rotation gears and focuser installed (dome control box also measures dome temperature and cloud cover). Completely unattended observation runs are now possible. 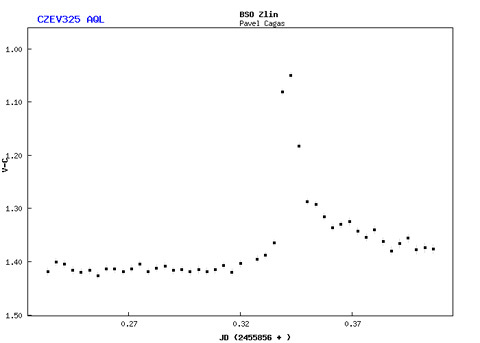 CzeV343 discovered (identified as simple Algol-type star at first). V729 Aql and 30 variable stars voted as the Czech Astrophotography of the year 2011. 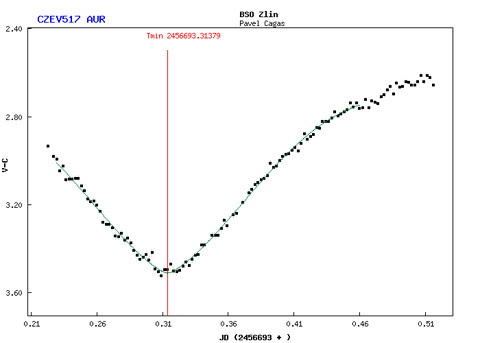 Image of V729 Aql variable star with attached light curves of 30 newly discovered variable stars awarded Czech Astrophotography of the Month for December 2011. Image composition by Vaclav Pribik. 51 new variable stars, registered in the CzeV catalog, was discovered at BSO within 2011. Number of variable star suspects await confirmation. 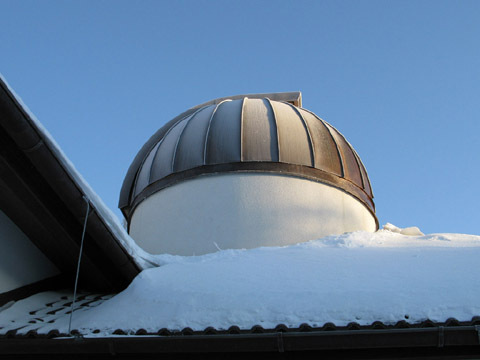 Presentation about issues and advantages of wide-field imaging in variable star research at BSO voted the second best paper on 43rd Conference on Variable Star Research held on Observatory and Planetarium of Johann Palisa, Ostrava, Czechia. CzeV325 -- UV Ceti type "Flare star" flare captured. New CNC-machined tube rings replaced original Orion rings made of rolled aluminum. 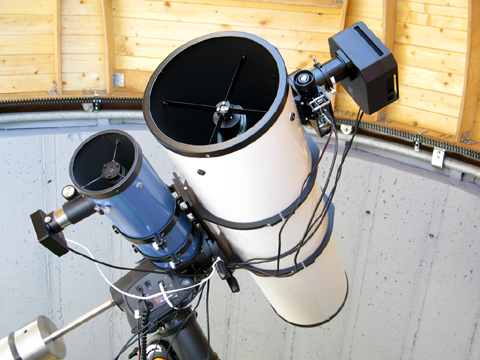 New longer and thicker CGEM declination pole made of stainless-steel allows smaller counterweights to balance the scope even with large-format G3/G4-class camera. New stainless-steel counterweights (there is nothing wrong with original Celestron counterweights, they are just made for smaller-diameter declination pole). 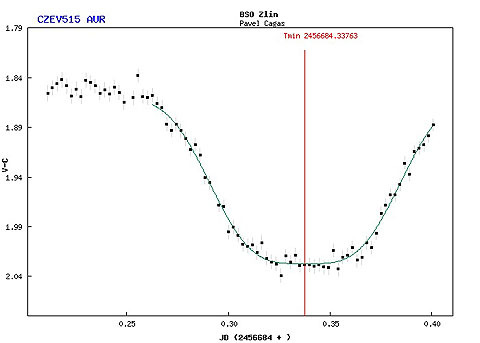 First new variable star discovered at BSO. 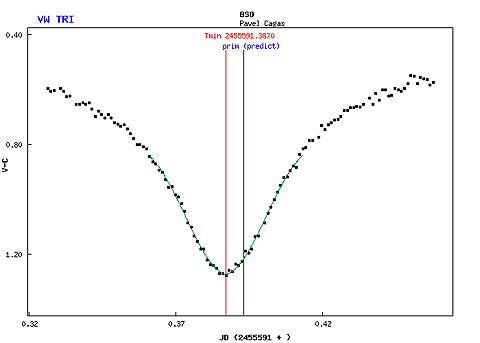 CzeV226 is an Algol-type (detached eclipsing binary) star with period 0.9015 days. 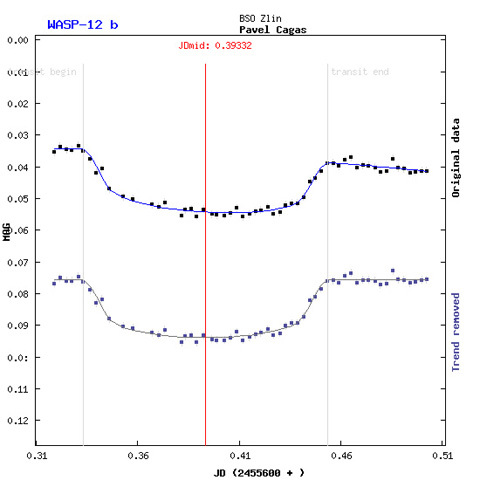 First exoplanet transit (WASP 12b) measured. Achieved just 0.8mmag RMS difference from optimal fit. First actual minimum of VW Tri measured. 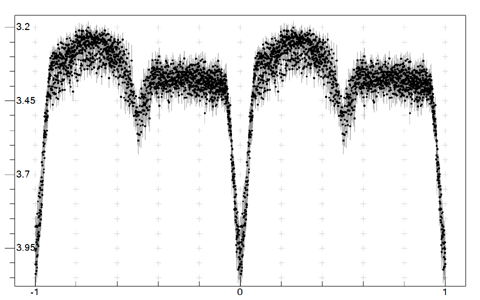 First light curve acquired. Minimum of V 394 Mon was actually missed due to too big error in minimum time prediction. 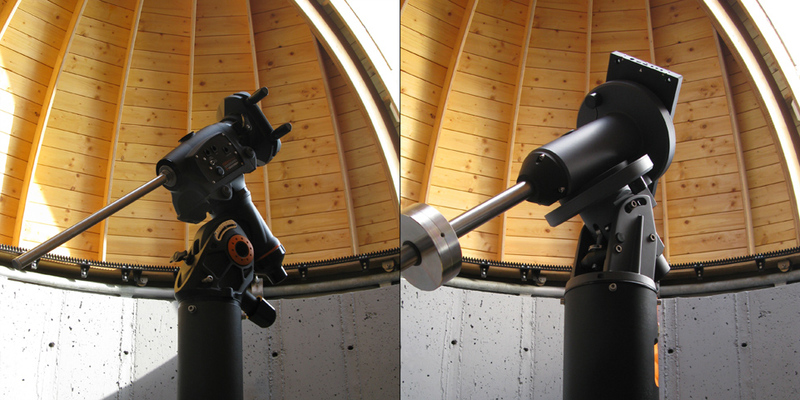 Second Orion upgrade -- new dovetail and tube ring adapters (original Orion parts were somewhat weak). First CCD light! 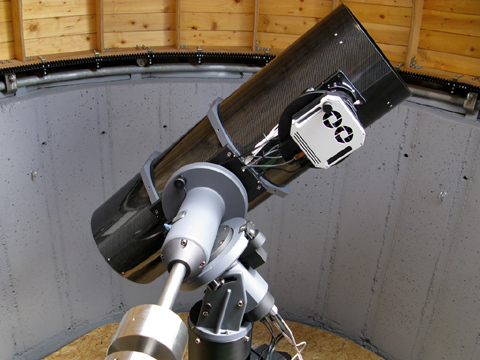 G2-8300 CCD camera with TeleVue Paracorr. 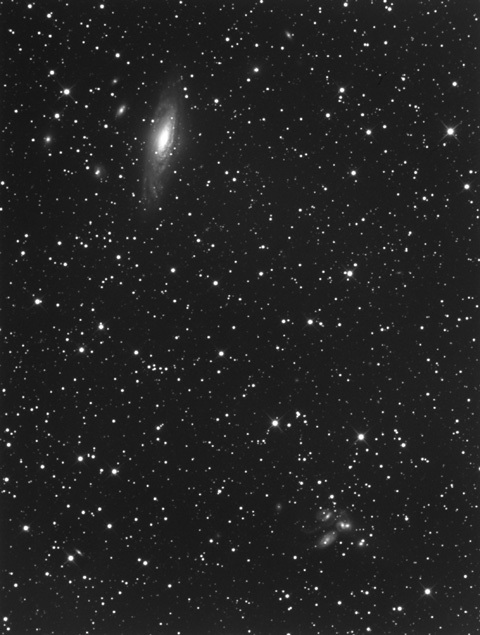 M31 (left) and NGC7331 + Stephan's Quintet (right). 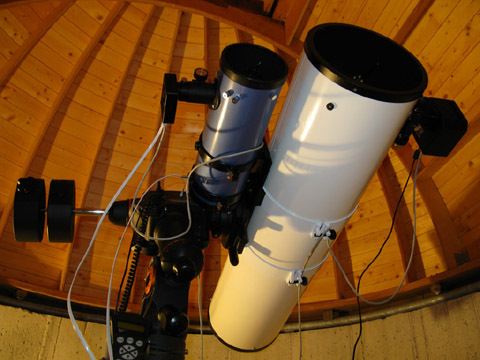 Getting ready for CCD imaging -- polar aligning the mount, tuning autoguider, etc. First light! Moon was really brigh and crisp :-). CGEM installed on its pier. BSObservatory dome under Blue Sky. 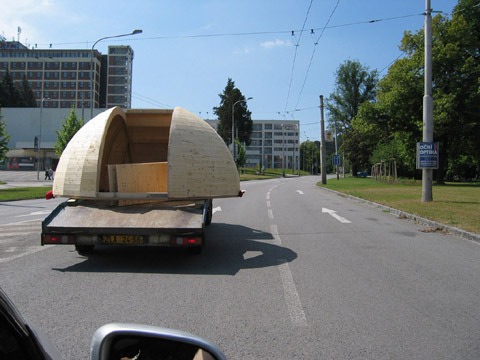 Building the dome elevated floor. 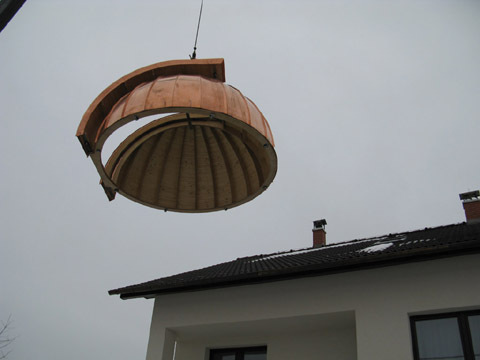 Dome coated with copper sheets moved to its base. 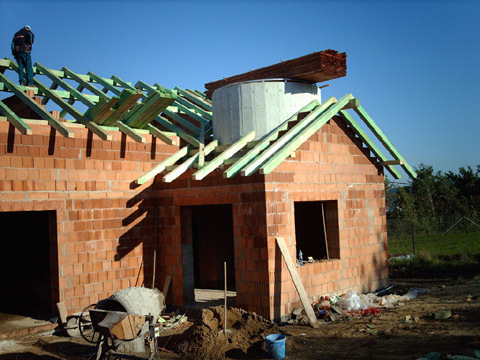 Building roof around dome ring. Telescope pier goes through control room. BSO is going to stand here. 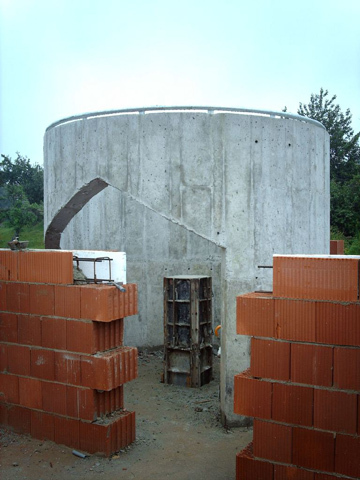 Telescope pier concrete foundation.